I'm a little crazy obsessive and want everything to be perfect. You would think as a mama to one cat and one toddler this would've changed by now. But it hasn't. This busy bag could've been a lot easier to make if I didn't suffer from "everything must be perfect" syndrome. Maybe you don't suffer from that syndrome. If not, please embrace that! I'm forever jealous of you. 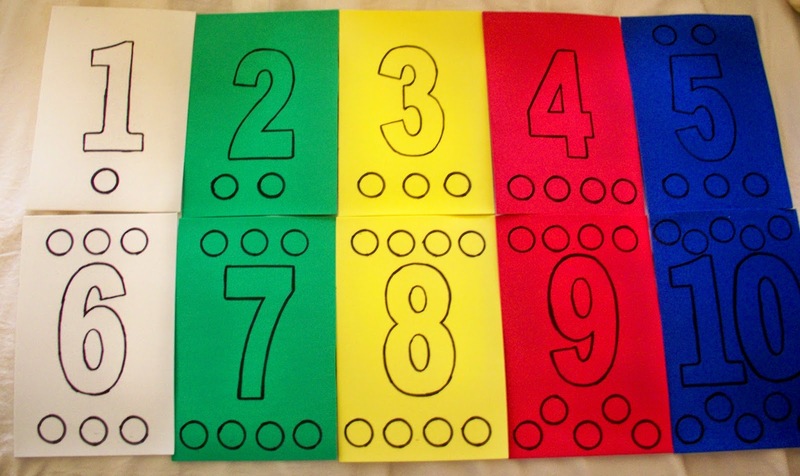 If you suffer from the above-mentioned syndrome, you will also need number templates to draw your numbers. I used the templates found here and adjusted the size of the numbers by copying them repeatedly until I found the correct size I wanted. I apologize, trees, for how many of you had to die so I could try to be perfect. If you have full-sized sheets of foam (8.5 x 11), measure them at the 5.5 inch mark and draw a line. Cut out the pieces of foam so instead of 5 pieces, you now have 10. See how good I am at math? HA. Print your number templates and adjust the size accordingly if you think you need to be perfect. Cut the numbers out and use your Sharpie to trace the numbers. If you are a rebel, just free-hand the numbers. Using a nickel and Sharpie, trace the nickel on each foam sheet to correspond with the number on the sheet. So for number 1, trace the nickel one time. For number 2, trace it twice (not in the same spot...). Put the finished foam sheets in a ziplock bag and toss in a bunch of beanies. Dunzo! The child will put the beans from the bag on each circle when working on this busy bag. This was pretty easy to make, except for all the copying and adjusting I did for the numbers. The busy bag is also pretty cost effective. I had everything on hand to make this except for foam sheets. I found a pack of 12 foam sheets at a garage sale for $1. I have no clue if this is a good price or not, but the price marked on it when it was purchased at a store was $2.44 (and that was on clearance). So I'm guessing it's a decent. I used 5 sheets from it so I may make another bean counting busy bag for a Christmas gift. And yes, I saved my number templates so more trees don't have to be killed.